My first thoughts: I love reading mythology. I already knew every small story of the epic Mahabharatha. Heard those from my father in childhood. So, iam not reading this book to know story. Kurukshetra war is the result of many politics, it is very interesting to know how people from same lineage fought for power, how alliances formed, what strategies are used, how betrayals happened and at last, how dharma won. Author's first note clearly says he is not retelling the epic but telling the story imagining every character as human with emotions. I liked this perspective. When we consider Sri krishna as God and read the story we believe everything he has done is right and good for the society. But, if we imagine him as a human being, we understand the reasoning behind each decision he took and his emotions. So, this epic can be read in a complete different perspective. Even though each character's name is explained just before the starting of the story, it was really confusing for me to follow for sometime. I got comfortable after reading a few pages. Matching the names that we now and the name they gave in the book is slightly time taking. I am reading part 3 book of chronicle directly without reading earlier parts, so it was difficult for me to understand terminology like 'Firewrights'. Plot: This starts from Krishna (Govinda Shauri, as mentioned in book) going to Kaurava court as mediator to negotiate on necessity of war. Since war became imminent, it becomes interesting how Kaurava and pandavas form alliances with other kings and make strategies for the war. The episode of Shikandi, his feelings of hatred on his own father, his revenge to Bhishma explained well. 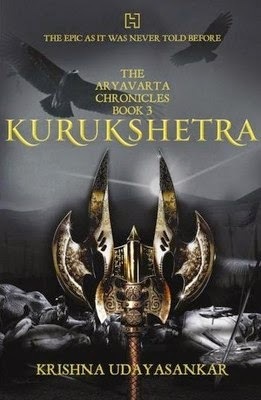 I don't know much about Uttara, Abhimanyu's wife until I read this book. She is shown as independent woman who thinks she is equally good as her husband. The final fight between Bhim and Suyodhana also explained well. I liked the book because it is not a retelling of the epic and it is interesting to imagine all Mahabharata characters as mortals. Author's knowledge, research and her interpretation should be appreciated for sure. Font size is a put down. Names of characters are slightly confusing. I felt, it would have been easy if I read earlier parts of this chronicle, before reading this one. I didn't feel it very easy to understand. One more thing, book might be boring for a few, as main focus is on war and planning for it. So, description of war, weapons, strategies, revenge and violence might not be a good time pass read. Pick the book only if you want to know more about Kurukshetra imagining every character as mortal.